Hot Cross Buns are a seasonal yeast bread traditionally served on Good Friday. These enriched buns are spiced with ground cinnamon, nutmeg, and allspice, and are studded with raisins (or currants) and candied mixed peel. What makes them instantly recognizable is that the tops of the buns are marked with a 'cross' which symbolically represents the Cross of Christ and the Crucifixion. After baking, I like to add a little sweetness to the Hot Cross Buns. Now you can do this by brushing the warm buns with a sugar syrup (boiled mixture of equal parts sugar and water), strained apricot preserves, golden syrup, or even honey. But what I like to do is to pipe a cross on the buns with a sweet sugar glaze made by mixing confectioners sugar (powdered or icing sugar) with a little milk. Hot cross buns can be eaten plain or buttered. Also very good when split in half, toasted, and served with butter and a slice of sharp cheddar cheese. There are many stories as to when the first Hot Cross Buns were made, and the story I like is related to the Anglo Saxons. It comes from Alan Davidson's "The Oxford Companion to Food". He tells us they were first made in honor of their goddess of Spring, Eostre, from whom the name Easter is derived. 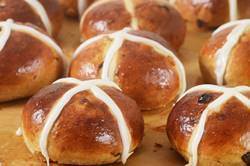 Today they are traditionally served at Easter and there is a superstition that Hot Cross Buns baked on Good Friday never became moldy and it is good luck to save one bun until the next year's buns are made. A few notes on ingredients. If using active dry yeast you will need to activate it before adding it to the batter. Do this by warming the milk until lukewarm (about 100 degrees F or 38 degrees C). Stir in the yeast and set aside for about 10 minutes or until the yeast is foamy and then add it to the batter along with the egg and butter. You can adjust the amounts and types of ground spices to suit your own personal taste. If you are unfamiliar with ground allspice, it has a spicy, almost woody, flavor of cinnamon, nutmeg, cloves, and pepper all rolled into one. While I have added brown sugar to the dough for sweetness you can use white sugar. Sometimes it can be difficult to find candied mixed peel so just substitute with more currants or raisins, or use dried cranberries and/or cherries. Hot Cross Buns: In the bowl of your electric stand mixer, fitted with the paddle attachment, combine the flour, yeast, sugar, spices, and salt. Add the milk, butter, egg, and the candied and dried fruit and beat until the flour is moistened. With the mixer on first speed, with the dough hook, knead the dough until it is silky smooth and elastic (about 5 to 7 minutes). Place the dough in a lightly greased bowl, turning the dough once, so the top is lightly greased. Cover with plastic wrap and let rise at room temperature (about 75 degrees F) (24 degrees C) until almost doubled in size (about 1 1/2 hours). When the dough is puffy and soft, divide into 10 equal pieces (about 100 grams each). Form each piece into a round ball (see video for demonstration) and place on a parchment lined baking sheet. They should be evenly spaced so they have enough room to double in size. Make an egg wash of one beaten egg with 1 tablespoon milk, and, with a pastry brush, brush the tops and sides of the buns. Lightly spray a piece of plastic wrap with a nonstick cooking spray, and place lightly over the buns. Let proof at room temperature (about 75 degrees F) (24 degrees C) until almost doubled in size (about one hour). When ready to bake, brush the tops of the buns with the egg wash. For the crosses, whisk the flour and sugar with enough water until it is of piping consistency. Place in a piping bag, fitted with a small plain tip (I used a Wilton #5), and pipe crosses on each bun (see video for demonstration). Place the baking sheet in the preheated oven and bake for about 15 - 17 minutes, or until the buns are nicely browned. Place on a wire rack to cool completely before glazing. Glaze: In a small bowl combine the confectioners sugar, vanilla extract, and milk and mix until smooth. Place the glaze in a small piping fitted with a small plain tip and pipe a 'cross' on the top of each bun. Let dry at room temperature.